Flashing back with yet another sonic Bear journal. 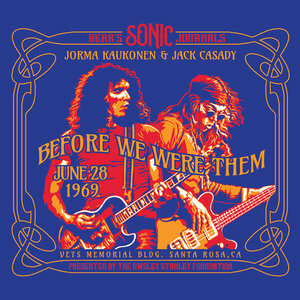 In the magical summer of '69 in Santa Rosa, LSD and sound pioneer Owsley 'Bear' Stanley recorded a gig of Jorma Kaukonen and Jack Casady (of Jefferson Airplane and future Hot Tuna fame of course) together with drummer Joey Covington. A pristine tape was only recently rediscovered, and if solid experimental jams in power trio mode, obviously inspired by the Hendrix Experience, sound like your thing, you know what to do.